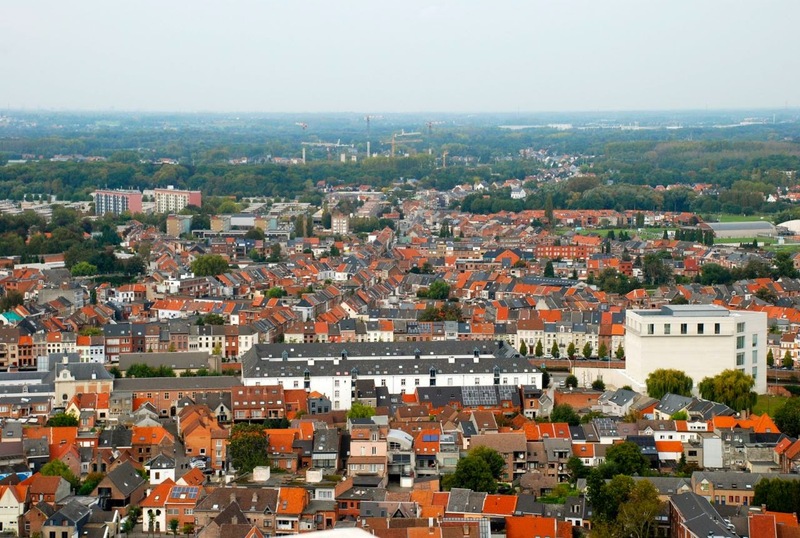 The Sint-Romboutstoren, a 100-meter tall church tower in the center of Mechelen, is visible for many miles before you reach the city. So it’s no wonder you can see far and wide when you climb to the top of it, as I did yesterday. Even though I was with friends & family who came to help me celebrate my birthday, the 540-step hike up a medieval spiral staircase was no cakewalk. But I have to say the view at the top was well worth it. Mechelen sits conveniently between Brussels and Antwerp, and on this clear autumn afternoon we had a good view of both. To the south we could see the Atomium and the Brussels skyline. To the north, the port of Antwerp and hints of the Antwerp Cathedral’s distant spire. And here in the shadow of the tower, where we keep time by the chimes of the church bells, is my neighborhood.